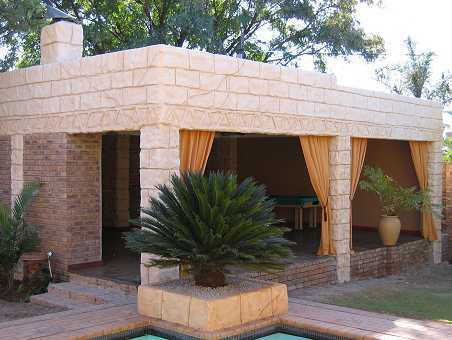 Condor House B&B is a luxurious bed and breakfast in the heart of Centurion. Established in 2003, we have had the honour to host guests from all over South Africa, as well abroad. Condor House is the perfect establishment to visit when you are travelling for business, pleasure or just for a weekend -getaway. Our immediate surroundings are peaceful and quiet, eventhough we are approximately ten minutes from major shopping and business complexes, like the Centurion Waterfront wich is well known throughout the country, and the Centurion Industrial and Business area. * Bar - Always open with a wide selection of beverages. * Dinner - Our menu has a wide variety of cuisine, depending on the season and your preferences. Dinner is served by request, in the dining room or outside depending on the weather. * Lounge - Relax in style in our luxury lounge, the perfect atmosphere for reading or enjoying a late afternoon drink.